Kwame Gyasi Cudjoe, the Most Exalted Excellency and Su-preme Leader of the Democratic Republic of Safo, made this pronouncement from an ergonomic recliner wrapped in the leather cut from the hide of an endangered African elephant that he had personally hunted and killed. Cudjoe’s flying throne was bolted to the floor in the salon of the presiden-tial helicopter. A standard Russian-made Mi-26P helicopter could carry sixty-three passengers, but the amenities added for the comfort and protection of the African leader cut that number in half. Cudjoe’s powerful frame was clad in khaki fatigues and his combat boots gleamed like polished black onyx. No car-toon general, the strongman wore a single star on his battle dress uniform that he earned during a storied military ca-reer, one that ended with the coup d’état that won him con-trol of the entire nation. He wore dark sunglasses, despite the shades being drawn over the porthole windows, and slowly swirled a glass of English whiskey in his left hand. The Safolese dictator traveled light today, his only guest on the flight from the capital being a swarthy Iraqi named Latif. “I think you will be quite satisfied with the demon-stration, Excellency,” Latif said, his eyes on the metal briefcase beside Cudjoe’s throne. Officially, Latif was an engineering consultant to the Safolese government, employed for his expertise in mining and mineral extraction. One of Cudjoe’s first official acts after seizing control of the country was to nationalize the mines. After all, maintaining a steady flow of gold and dia-monds from the earth was essential to replenishing the na-tion’s coffers. Few aside from Cudjoe knew that the engineer’s identity was a fabrication to conceal a fugitive. Prior to the US-led invasion of Iraq, Latif had engineered chemical weapons for Saddam Hussein. For his efforts, he was made the five of di-amonds in the US military’s “Most Wanted Iraqi” playing cards. In homage to Latif’s infamous past, Cudjoe’s brief-case contained the Iraqi’s fee in uncut diamonds. At twenty-two, Tanu Baafi was the youngest member of the eight-man security detail aboard the helicopter. The reedy lieutenant’s decade-long climb through the ranks began when he was conscripted as a boy during the civil war that followed Cudjoe’s coup. One of the few boy soldiers to reach manhood, he had made a profession out of the only skill he possessed. It was the height of the dry season and the tall grass-es of the vast northern savanna stood sun-bleached and brit-tle as straw. The flight ended at a large rectangular clearing of scorched earth. Baafi studied the scene outside the porthole window as the helicopter slowed to a hover. Several khaki-colored military trucks lined one side of the clearing, showing at least forty soldiers. Two large, open-sided tents formed a command post with an array of communi-cations and weather gear. A windsock fluttered limply, indi-cating a mild wind blowing out of the Sahara. A lone transport stood at the far southern end of the clearing—a Bofors FH77 Archer. It was an articulated, six-wheeled truck consisting of a four-man armored crew cabin in front and a 155mm, self-loading Howitzer turret in the rear. The barrel of the field cannon stood at a high elevation, aimed at an unseen target several miles distant. The helicopter landed in the center of a large H paint-ed on the ground on the opposite side of the clearing from the Archer. Baafi and half the security detail deplaned first, followed by Cudjoe and Latif, and the remainder of the men. The general in charge of the field test and several members of his staff snapped to attention as their command-er-in-chief approached. Cudjoe parted his security detail and saluted the officers, then turned his attention to the general. “Does that meet your specifications?” Cudjoe asked Latif. The Safolese leader and his guest were shown to seats beneath an open tent with a clear view of the Archer and an array of large LED screens displaying terrain and weather data. After the flight, Cudjoe preferred to stand, locking his gaze on the long, slender cannon pointed skyward. The Archer shuddered as the Howitzer roared and the first shell flew into the air. The turret adjusted slightly for the second round, then the third. In a mere thirteen se-conds, three volleys arced across the savanna. The woman did not hear the Archer’s thunder as she sat weaving a basket, but noticed that the many birds that popu-lated the massive acacia tree had suddenly grown silent. She then heard a faint whistling growing louder like an angry kettle on the fire. There was an explosion overhead, followed by a puff of smoke that appeared above the treetop. The birds scattered as tiny metal fragments rattled through the branches. After two more explosions marked the sky, the three smoky clouds formed a triangle over the small village. Some of the wom-an’s neighbors looked up from their chores while others ran for shelter. As she watched the wisps of smoke, the woman detected the aroma of bitter almonds. Several birds fell from the sky and landed nearby, their bodies racked by death spasms. The woman pressed the fabric of her boubou tight against her mouth and nose, praying for the nightmarish scene to end. Her breathing came in panicked bursts and her heart raced inside her chest. Dizzy and nauseated, the woman collapsed against the trunk of the tree. Cudjoe watched the airbursts over the village on the monitors. Remote cameras fitted with telephoto lenses cap-tured the scene, including the deaths of many birds as they attempted to flee the upper limbs of a large acacia tree. Baafi collected a radio headset and joined the rest of the survey team as they boarded a truck for the test site. Kijiji was only a few kilometers downwind from the Archer, so the heavy truck closed the distance on the rutted path quickly. One kilometer north of the village, the truck stopped so the occupants could don chemical suits. Baafi felt his body temperature rising inside the suit as he secured the seals around his wrists and cinched a web belt with a hol-stered pistol around his waist. He took a few slow, deep breaths to suppress a growing sensation of claustrophobia. The truck stopped just north of the village and the survey team covered the remaining distance on foot. The vil-lage was a typical collection of cylindrical buildings with conical thatched roofs joined by low walls to form a com-pound. In a noticeable break from tradition, no one came out to meet them. Baafi heard nothing but the rustling of the multi-layered chemical suit and his own breathing. The wind barely fluttered the leaves of a large acacia tree. All else was still and silent. He followed the team into a large building that served as the entry into the compound. Inside, they found an elder-ly man, likely the village chief, lying on the ground. His eyes were rolled back such that only white was visible. Foamy spittle ran from his mouth. More bodies lay inside the compound—adults and children and the livestock either dead or dying. The poison unleashed by the Iraqi engineer spared no one, not even the flies that feast on the newly dead. Baafi had seen death before and had on orders killed many, but the murder of this village felt evil. The temperature inside Baafi’s suit was climbing. With sweat beading across his forehead and soaking his uniform, he steadied himself against a doorway to counteract his growing light-headedness. As his vision cleared, he noticed the traditional mural painted around the opening. Though common to this region of Africa, intricate geometries on this doorway seemed impossibly familiar. His eyes swept back and forth across the design and he knew that he’d seen this pattern before. One of the few memories Baafi retained from his abbre-viated childhood was of his mother decorating the doorways of his village. He was perhaps five and his mother had taken a break from painting to get a drink of water. Imitating her, he had stuck his hand in a bowl of ocher paint and made a full handprint on the wall. His mother reprimanded him, but incorporated the mark he’d made into her design. The hidden handprint was their secret and only they could see it. Near the bottom of the right jamb, Baafi found his mark. Baafi fled the courtyard, fearing that his suit had failed and that whatever had killed these people was begin-ning to affect him. He bent over, hands on his knees, gasp-ing and overheated. Gradually, his heart rate returned to normal and he realized he wasn’t dying. He then heard foot-steps approaching from the village. “You okay, man?” the squad medic asked, looking through Baafi’s face shield. Baafi nodded. The medic patted him on the shoulder and returned to his work collecting blood samples from the vic-tims. Baafi had seen enough of the village and would remain outside its walls. He spotted the acacia tree and felt that eerie sense of déjà vu again. As a boy, he and his friends had climbed in a tree like this one. To see such a great living thing amid so much death seemed comforting. He found himself drawn toward it. Baafi was only a short distance away when he spotted the woman seated at the base of the tree. A partially woven bas-ket having tumbled from her lap, she lay back against the trunk with both hands holding the cloth of her dress against her mouth and nose. Baafi squatted in front of the woman and saw that she was not breathing. Gently, he lowered her hands into her lap and pulled the printed cloth of her boubou away from her face. Though the years and grief over the loss of a son had left their mark, he instantly recognized his mother’s face. And the lies of his mother’s death and the razing of his village by Dutannuru rebels were laid bare. 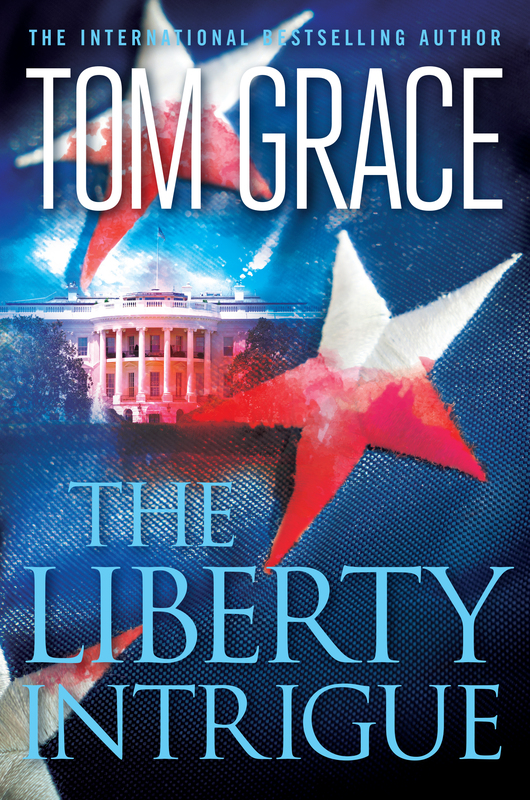 Excerpted from The Liberty Intrigue by Tom Grace. Copyright © 2012 by The Kilkenny Group. All rights reserved. No part of this excerpt may be reproduced or reprinted without permission in writing from the publisher.